In the world of open-source software, you’ve got an interesting marketing challenge. You’ve got a near commodity product that’s freely available online. You add a layer of customer services and support on top of it to monetize the software for the business. But as you can guess, the traditional open source customer is pretty frugal. Linux often entered the workplace though the back-door with techies trying it out and as they test out the platform, it slowly embeds itself into the organization and becomes a valued part of the IT infrastructure. At that point and time, Linux is now a production platform and requires enterprise support (Red Hat Enterprise Linux) and the associated tools. But if I could distill the traits of the typical open source customer its: bright, demanding and cost-conscious. These are techies that were ambitious enough to try a new technology, smart enough to find its value with the expectation of getting things to work at little or no cost. 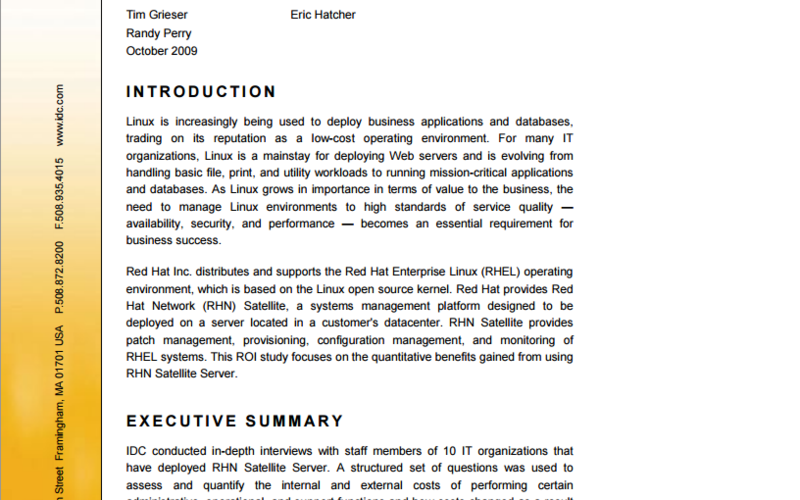 In my role as a Product Marketing Manager for Red Hat’s Systems Management team back in 2009, the challenge in front of me was to convince Red Hat customers to upgrade their environment to Red Hat Satellite, a Linux system management tool that they would pay for. Tricky, huh? The customers barely want to pay for the software and associated support. How can we get them to now pay for more advanced tools? Linux system administrators have all sorts of free, hand-made tools at their disposal. And while they do work, they aren’t built for larger Linux environments and don’t scale well. But Red Hat Satellite system management is built to work well in enterprises. The tool had a great reputation from a technical standpoint but how do we convince customers to purchase? While social proof can be powerful and influential, I knew there was need to convince the financial IT persona. Most likely an IT Director with sign-off authority for $25 – $50k. Enter IDC Analyst group! IDC is a well know IT analyst group that covers a variety of technology areas and also creates custom whitepapers for companies. Over the course of four to six weeks, we engaged IDC and contracted them for a whitepaper covering the ROI of Red Hat Satellite System Management. IDC had a published methodology of pain-stakingly interviewing a set of customers to determine time saved and the appropriate dollar amount that could be attributed to this time-saving tool. Working with the Red Hat customer reference team, we introduced IDC to our larger customers who engaged their IT teams for interviews. Work on the body of the whitepaper continued separately with a subject matter experts while I managed the overall project. By late 2009 we were wrapping up production and the final draft of this whitepaper and it was impressive. Savings with Red Hat Satellite were significant and now quantified in a whitepaper from a well-respected third-party group through data from independent companies. Financial proof from a wide variety of successful companies who would mirror our potential customer base. An asset that a director could take to his/her VP to secure budget for the purchase. And IDC had another published piece of their authoritative knowledge in the Open Source system management realm, wins all around. I remember when we first started up this project with IDC and my boss Bret asking me whether we needed to spend a 1/4 of our yearly marketing budget on this piece. To which I replied, absolutely yes. After my departure from Red Hat, I heard this ROI whitepaper had become a key marketing asset for convincing the financial IT buyer at Red Hat and had closed numerous deals over the past two years. Yes, sometimes you can get a great marketing story for the price of a candy-bar. Other times you need to pony up the money and pay for a marketing asset with an analyst group that will return its own ROI, many times over. Technology is only as good as how much it improves a business initiative or saves money, especially for a fiscally prudent IT buyer.